I was texting my friend Jeff and I made a typo — I intended to say I was going to “make some artses” (aka make some art), and I managed to leave out the t. Being a fan of certain British books and TV shows as I am, I immediately said that I couldn’t guarantee whether or not there would be arses. 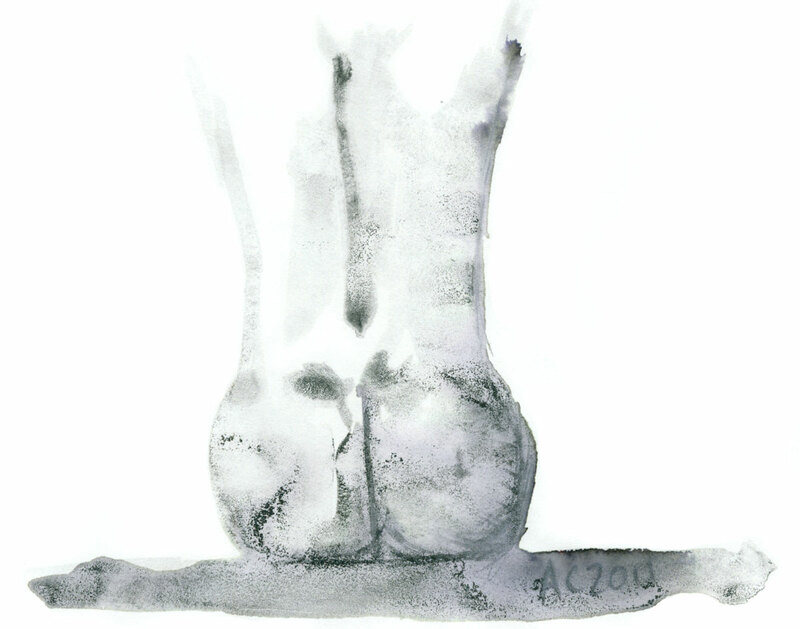 I was testing out my very cool new Lunar Black watercolor, and I had some left on my palette from the art you’ll get to see next week, so I decided to pull out my sketchbook and draw this so I’d have at least one arse to show for the session. The paper wrinkled and the paint ran and granulated, so I supplemented it with a little bit of pen and ink work, including the signature, dipping the fountain pen right into the watery puddles of paint still on the page. I cheated and photoshopped out the buckled paper, but you can see places the paint pooled more thickly. I do love the granulated textures the lunar black leaves, and painting bums, so perhaps I’ll try again on a thicker paper.